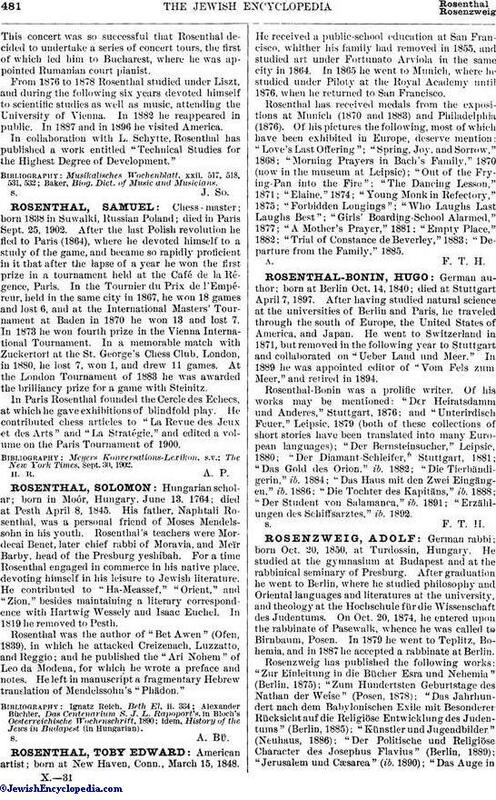 Chess - master; born 1838 in Suwalki, Russian Poland; died in Paris Sept. 25, 1902. After the last Polish revolution he fled to Paris (1864), where he devoted himself to a study of the game, and became so rapidly proficient in it that after the lapse of a year he won the first prize in a tournament held at the Café de la Régence, Paris. In the Tournier du Prix de l'Empéreur, held in the same city in 1867, he won 18 games and lost 6, and at the International Masters' Tournament at Baden in 1870 he won 13 and lost 7. In 1873 he won fourth prize in the Vienna International Tournament. In a memorable match with Zuckertort at the St. George's Chess Club, London, in 1880, he lost 7, won 1, and drew 11 games. At the London Tournament of 1883 he was awarded the brilliancy prize for a game with Steinitz. In Paris Rosenthal founded the Cercle des Echecs, at which he gave exhibitions of blindfold play. He contributed chess articles to "La Revue des Jeux et des Arts" and "La Stratégie," and edited a volume on the Paris Tournament of 1900. The New York Times, Sept. 30, 1902.